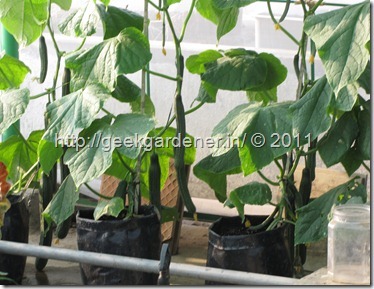 This article is a continuation of Part I of Hydroponic Cucumber production. The response to the previous article was amazing. Questions started pouring in in huge numbers. This shows how much interest people have in commercial hydroponics. 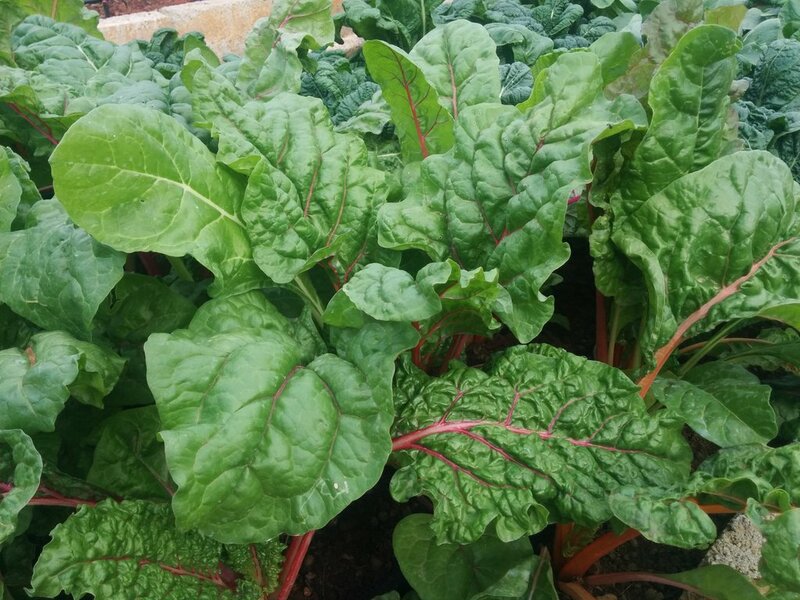 I will try to keep these articles simple for a home gardener and at the same time, sticking to methodologies followed for a commercial production. This last part dealt with seed starting, transplanting and training. This part will deal with crop management, irrigation, fertilization and harvest. These plants are about 40 days from the date of sowing. They are sown in black polythene bags filled with coco peat media. Each bag contains about 12 liters of media in it. If it is mini cucumbers, there can be 2 in a bag but for bigger English cucumbers one per bag is recommended.The spacing of the plants are at 16-18 inches apart. It can be observed that there are flowers on all the nodes. English cucumbers are parthenocarpic. It means, there is no need for pollination for the fruit set. This feature makes it a wonderful candidate for greenhouse growing. The grower need not worry about brining in bumble bees for pollination. Also, all the flowers are female flowers. As many flowers there are, that many cucumbers you will get( Well, Technically! 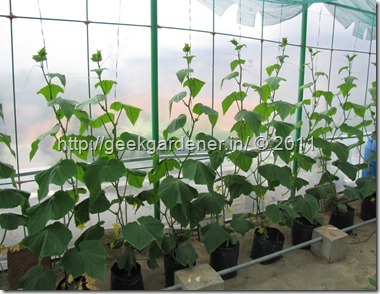 ).In the picture to the left, you can see the tender cucumbers growing vigorously. It takes 10-14 days for a cucumber to mature. It grows very fast especially in the last few days of that duration. 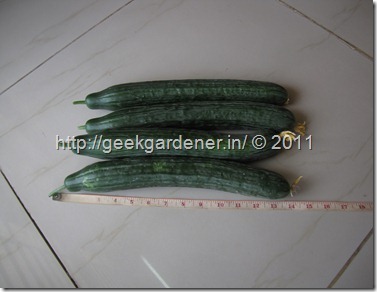 The weight ranges from 400-550grams per cucumber. This weight depends on the stage of picking. These cucumbers are approx 1 week old ( from the day of flowering). The ridges are a feature of the cucumber variety and they gradually become very shallow as the cucumber matures.The skin is very thin so care should be taken to immediately store them in a cool place or shrink wrap them. Otherwise, they can lose moisture too quickly and become soft and rubbery. 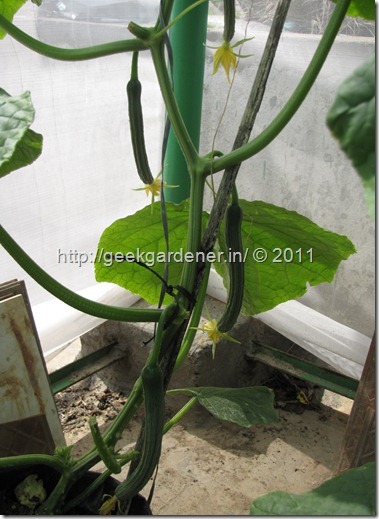 On the left, is cucumber 2 days short of harvest. More you leave on the plant, more nutrients are diverted to the old cucumbers and this might delay new ones getting formed at the top. Always maintain a balance with respect to number of fruits per plant. 6-7 fruits at any point in time is a good number. More than that, one might experience deficiencies of calcium due to the inability to support more fruits. The plants are allowed to reach the top overhead wire. Till it reaches that height, all the side shoots and branches are removed.Once it touches the overhead wire, the top is cut off and two branches are allowed to form. They are allowed to fall down from the top. Care should be taken such that the stem doesn’t break as it winds around the wire. The fruits are allowed to form on the laterals.These plants on the left have about few inches before their tops are cut off and are allowed to branch. Most of the questions, I received were related to this one topic. Nutrient! Nutrient! Nutrient. 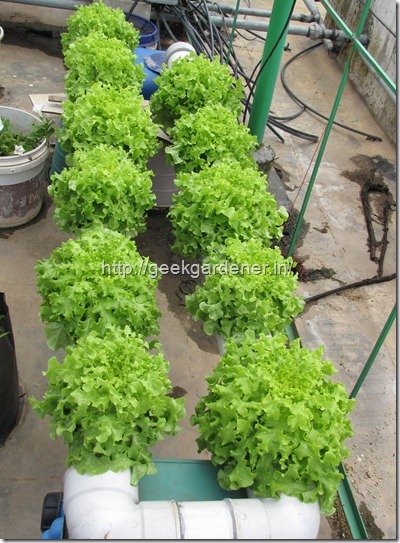 My idea was to write a dedicated post on Hydroponics Nutrients. Not just for Cucumber but for any crop. A subsection in a post will do no justice to the topic. So in this section I am just going to mention the ppm values used and deal with this topic in detail the next post. It is important to remember that the nutrient is only part of the equation. There is no one single nutrient for any crop. Plants tolerate a range of nutrients. It is the growers responsibility to read the plant and if necessary modify the nutrient to suit the environment. Regularly “read” the plant for deficiencies, toxicity, insect attack. If you find certain the plant is too vegetative( lush leaves, less/no fruits), then take certain measures to steer it into generative mode. There are lots of methods one can use to steer the plant towards vegetative or generative. Temperature, Irrigation duration/frequency, Electrical Conductivity(EC) are some of them.So one formula doesn’t suit all. It needs to be tailored to the area. In the coming posts, I will explain in detail about How to make hydroponic nutrients and how to modify it to suit the plants need. Also on how to “read” your plant. This is 1st Harvest. Each cucumber weighed 500-550 grams. We were very excited that we didn’t even eat these cucumber for couple of days.It was like ..in the song from “Damadamm” no touching no touching.. only seeing only seeing”). Most of them averaged and 14-15 inches but some of them dared 17inch mark. This was from one plant that was first to yield. It was also the one that had saw-dust mixed in along with cocopeat as a trial. I was impressed :D.
2nd Harvest was huge. 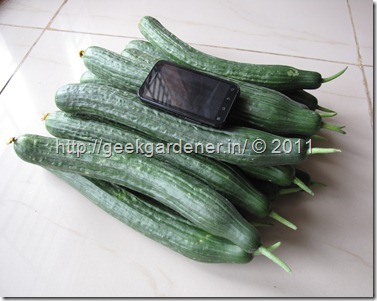 I picked about 20 cucumbers and what I liked about this crop was the uniformity. 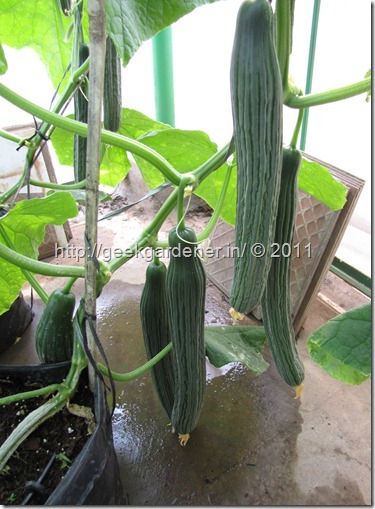 Every plant had almost same number of cucumbers on them and was quite a view in my greenhouse. One thing to remember with english cucumbers is that they have a very thin skin. If not stored properly, they lose water very quickly leading to a soft rubbery fruit. They remain crunchy for a long time if stored properly. The fruit is so juicy and crunchy without the seeds coming your way. 3rd Harvest and again I got 20 cucumbers. At this point, we were loaded with cucumbers in our house and I already started selling this to my colleagues at work. Who doesn’t love vegetables delivered to their cubicles.. Parallely I had beefsteak tomatoes growing and their yield was pretty good as well. It was tomato and cucumber month. I had so much surplus that I approached nearby Vegetable supermarket and the push cart guys. To my surprise both of them agreed in a jiffy. The best part was I got to set the price and they were ready for it. They also said that they will take lettuce and other exotics I grew. So far, I have harvested around ~40 kg. The crop had its share of insects. 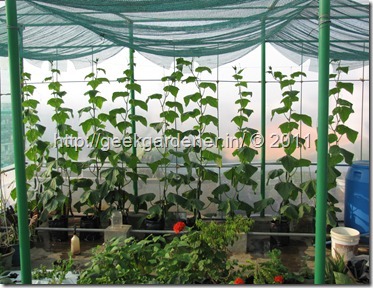 I will handle insects and diseases to watch out for in cucumber production in my next post which is Part III. 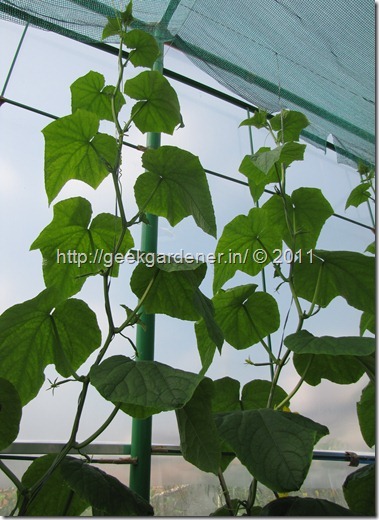 Hope you all enjoyed this part of the Hydroponic cucumber production series. You continue to inspire us all. I love the part where you were able to set the price. Now please stop being a tease and get that NS recipes and NS management out soon. Thanks. Regarding the NS recipes. I wanted to kinda publish that along with this. But later realized that it needs a separate post for listing out various terms, measurements..dos and don’ts. So when people search for Nutrients, they see this and not something with cucumbers in it. So I put the ppm values in this post. The next post is getting ready with NS recipes, recommended EC, pH and NS management, deficiency identification etc. Lovely! great, you are an inspiration. Liked the part, no touching… only seeing:-). Would like to know about the methods that you use to control mealy bug without chemicals. Please write about that. 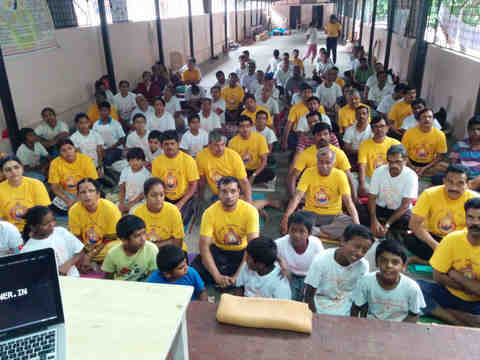 Lovely Post..This article is not only interesting but informative as well.You are such a great inspiration for all of us.I just learned a lot from your post. Thanks a lot. One week later we are all eager waiting for the post related to NS Recipes. Absolutely awesome! The plants are healthy and the harvest is beautiful. Thanks for writing about it. 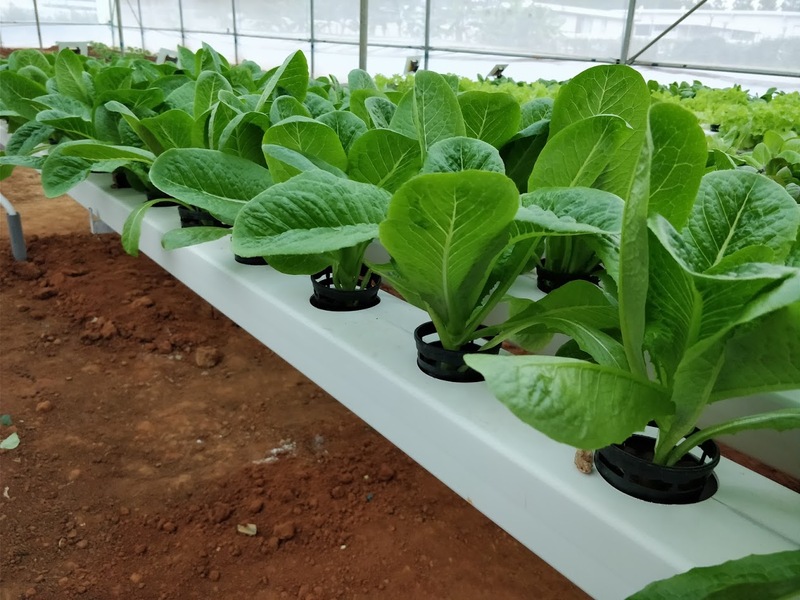 VERY INFORMATIVE.THANKS FOR ENLIGHTENMENT ON HYDROPONICS.CAN YOU SUGGEST WHETHER COWS URINE, WORMIWASH,CAN BE USED INSTEAD OF SOLUBLE CHEMICAL FERTILIZERS IN ORDER TO GET ORGANIC PRODUCE. Great post here and a good read! 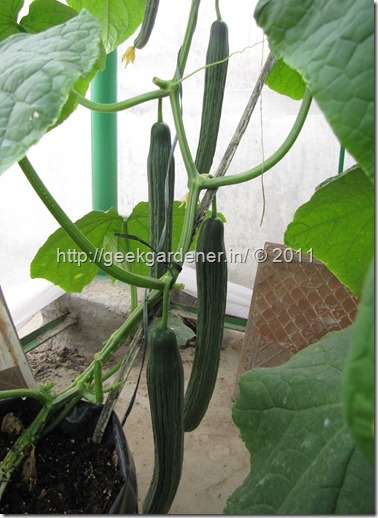 Do you continue growing hydroponic cucumbers even now? 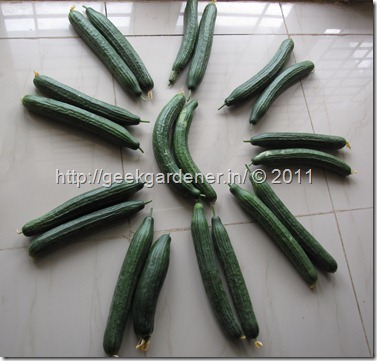 We have toyed with cultivation of Cucumbers and Gherkins but are not seriously enough. Did you face any significant pest / plant maintenance issues? Will try looking for Part III of this blog. 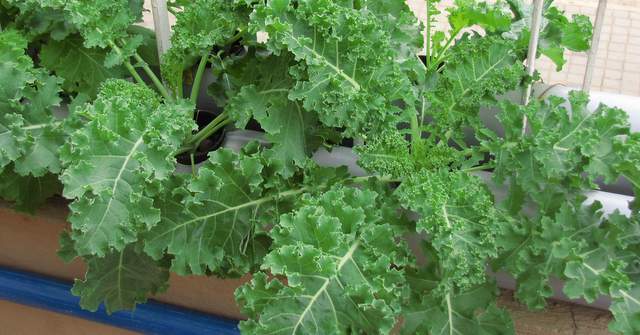 If you are growing in hydroponics (without soil), you need to have a separate nutrition. If you can send some photos of your plants, I can identify the problem. really usefull post. i got all the necessary info. i had been looking for. secondly,i have a problem. i have a lemon plant that i grew from a seed about 5 years ago. it is about 5 feet tall. it has never had fruit or even flowered. now the older leaves on it are starting to yellow. i think it is because of low levels of nitrogen. if there a way to supply nitrogen without fertilizer and compost(since they are not available here). are there any household materials i can use. also are there any tricks to make it bear fruit? 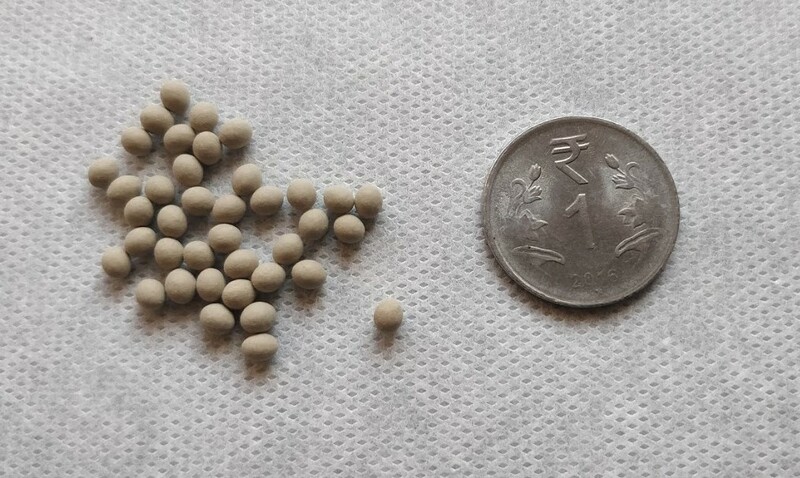 You can try used coffee powder as nitrogen supplement.